The Euro spent months forming a triangle. And I called it a leading diagonal. But the dip in May was not large enough. A leading diagonal is a wave 1 pattern. Wave 2 is a correction that should retrace wave 1. That did not happen. So it is possible to mark the Euro as a triangle as shown and the trend up starts as an impulse only from the April low. This is a viable option and we will leave it open. The implications for the trend are nothing. It will only come into important when we try to mark an end to the Euro bull market 5-7 years from today. Right now we are trying to count 5 waves up from the April low and are only in wave 3. So no meaning top is around the corner. Short term reactions however cannot be ruled out whenever we get short term overbought. That is all. One more dip in the dollar index to maybe 96.40 would complete wave III and a short term bottom for wave IV up may develop. Sentiment in the dollar is now at 5% bullish only which is a super extreme. A little cooling off for a few weeks in wave IV should create the space for wave V down. Does low Volatility matter? Two weeks India VIX reported a very low reading and we did get a broad market correction. But does the lowest reading in history mark a major top in markets. On twitter there was an exchange that IV rises before a top. Yes this has happened many times and could almost be true as gospel. So let us look at the chart below of the US VIX It made a bottom 1993 and rose from there for years. The final top for the markets was in 2000, 7 years later. It bottomed again in 2006 and the final top for the market was 10 months later in 2007 [S&P). Now the trendline of those two lows was kissed this month. Maybe we have a new low or bottom in VIX and volatility only rises from here. 7 years and then 10 months are hardly any time correlations that we can draw as to how long after a bottom in VIX can we get a top in equities. 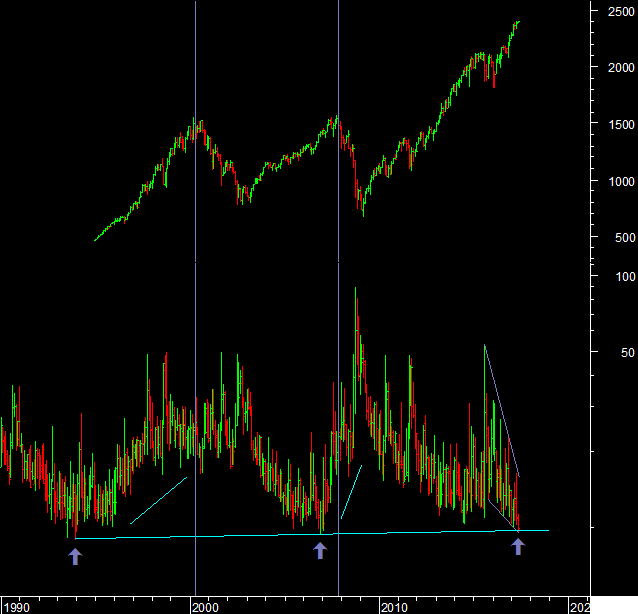 It is true that short term rallies in VIX are associated with short term correction in equities. What is not clear is the long term relationship. All that we should think now is that this is an unusually low reading for the US VIX and a US stock market correction is the least you can expect. What it might mean for the longer term would require a long term analysis of the US equity indices themselves. China’s yuan slipped to the seventh-most actively traded currency in the league tables for global trade finance, transaction service provider SWIFT said. A struggling overseas offshore market in the renminbi has hurt the usage of the Chinese currency in global trade in recent months and the latest ranking is yet another indicator of the bearish sentiment surrounding the currency by global companies. The United Nations (UN) has committed to review the trade financing gap and its underlying causes as part of its annual assessment of progress in mobilising finance to support sustainable development. According to the ICC, the “chronic” shortfall has come about largely on the back of the unintended effects of global financial crime regulation. The Asian Development Bank’s (ADB) Trade Finance Program (TFP) and two Vietnamese banks — An Binh Joint-Stock Bank (ABBANK) and Tien Phong Commercial Joint-Stock Bank (TPBank) — today signed agreements enabling the program to provide guarantees of up to $50 million annually to support trade finance in Viet Nam. Two banks in Bangladesh have borrowed money from international development banks in order to provide trade finance locally. In separate transactions, the Asian Development Bank (ADB) and International Finance Corporation (IFC) extended loans to commercial banks in the promising South Asian economy, for the purpose of on-lending to their local clients. In the post-crisis world, Goldman Sachs is not seeing the growth it wants from the businesses for which it is best known – investment banking, trading and managing money for the wealthy – so it is considering expanding into new areas, including trade finance, The Wall Street Journal reports. ArcelorMittal SA has closed a revolving R4.5bn structured commodity-trade finance facility over 36 months to finance working capital, as part of its balance sheet restructuring. Note: Adam Smith Associates Pvt Ltd is a leading Trade & Commodity Finance service provider in India with presence in Asia, Middle East & West Africa. The above content is purely for information and has been sourced from different online portal for information purpose only. The Dollar index broke the recent swing low and started to extend down in wave iii of 3 of 3, to 97.1 next. This means that a major fall in the dollar has started. This should cancel out most of the bullish dollar wave counts that were still open. The US bonds retraced 61.8% and started to rise again, Wave C up for bonds should mark another risk off for US equities. The Ratio of the Sensex to NSE MIDCAP 100 is pushing at the extremes. The pink and yellow lines are a break point. On a long term basis these levels are in bubble territory and highest on record, but there is no sign of stopping. That said at such level it is hard to keep sounding the alarm bell on caution. Not something people like to hear especially if stocks are randomly going up 10% everyday. The markets cause a self feeding behaviour that causes these levels of optimism. The closest to this enthusiasm goes back to the Harshad Mehta boom. Though not in terms of the IPO market but yes in terms of the will of the masses to participate irrespective. The A/D ratios are also still diverging. Yes if the market keeps going these will pick up but they have not yet done so. The 20day ratio is clearly made a lower top and declined in the last 8 days. The US VIX has been in the news in the last few days. So right after the India VIX made its lowest reading on record, the US VIX has dipped to a low that touches the trendline of the low in 1993 to the low in 2006. In the long term history of the VIX these low points did not mark major market tops. At the same time it maybe noted that the US VIX rises higher much before such an event. So volatility was already rising into the 2007 S&P top before it happened. On the other hand shorter term lows in the VIX have been associated with near term market corrections and therefore we may still pay attention to it. 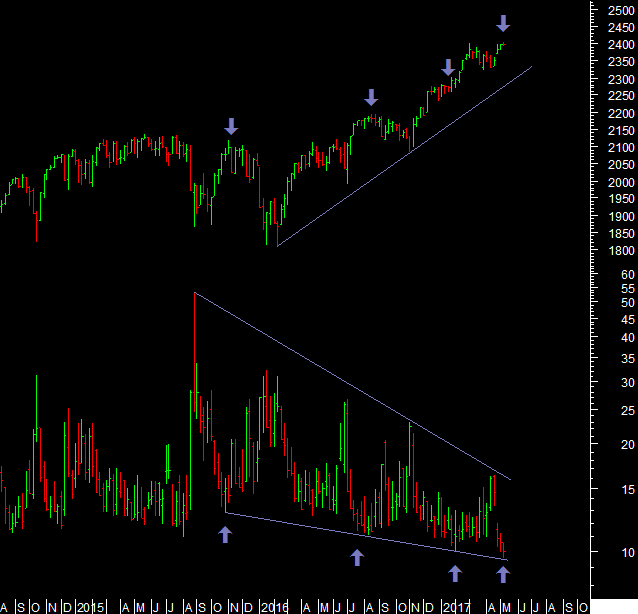 The recent low is also on the trendline of the lows of the last two years. So a rise in near term volatility from here when it happens would give us a near term correction is all we can say with this. Adam Smith Associates offers trade & commodity finance related services & solutions to its domestic & international clients. Views expressed in this article are purely of the author – Mr Rohit Srivastava – a leading technical analyst. Visit www.adamsmith.tv for services offered by Adam Smith Associates Pvt. Ltd.